While out for a walk with her mom, a little girl has the surprise of her life — she meets a real, live, fire-breathing dragon! Now this dragon is nothing to be afraid of — in fact, he’s so friendly that she invites him home for tea. But their afternoon snack is suddenly interrupted when the dragon sneezes and sets the table ablaze. Luckily, the girl knows just what to do, and she teaches her new friend to be fire smart, too. 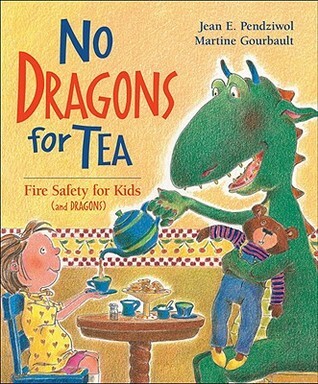 With its funny, rhyming verse and spunky illustrations, No Dragons for Tea shows kids that learning about fire safety doesn’t have to be scary. The story ends with “The Dragon’s Fire Safety Rhyme” — a fun and easy way to remember what to do in case of fire. This is such a cute story while being very informative about fire safety and the illustrations are wonderfully done with eye pleasing colors. I highly recommend this little book if you have young children. I’m planning to order one for my niece, Kate, even though her Dad is a fireman (excuse me-fire fighter) and has probably taught her about fire safety.